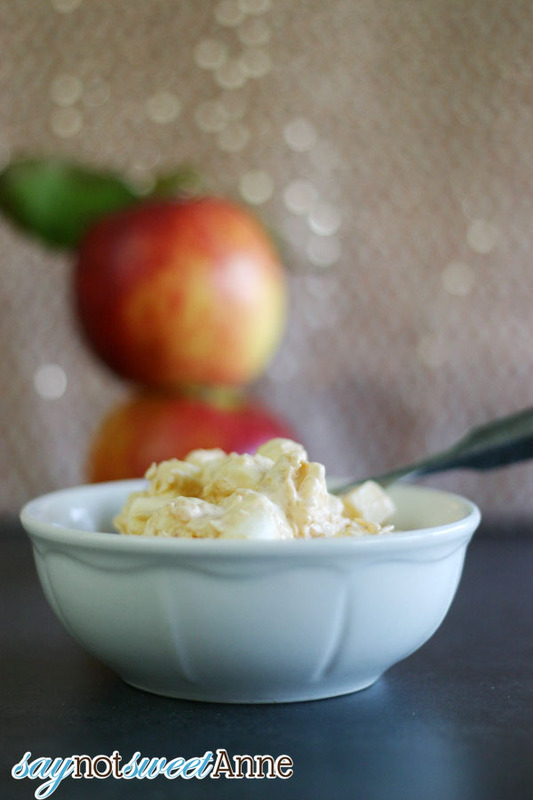 The first time I’d ever heard of Caramel Apple Salad, it was at the tasting for our wedding. Being that we were being wed in February, our choice of fruit dishes was slim. Our caterer ensured us that everyone would love their “secret recipe” Caramel Apple Salad, and they were right. The sweetness in this dish paired with crisp apples was delicious. We decided to put it on our wedding menu. The day before our wedding, Hubby and I were in the reception hall setting up. The caterer was there prepping dishes and left a crumpled notebook on one of the tables. In need of a scrap of paper to jot things down, I opened the notebook searching for an unused sheet. What I found, was a list of hand-written recipes. 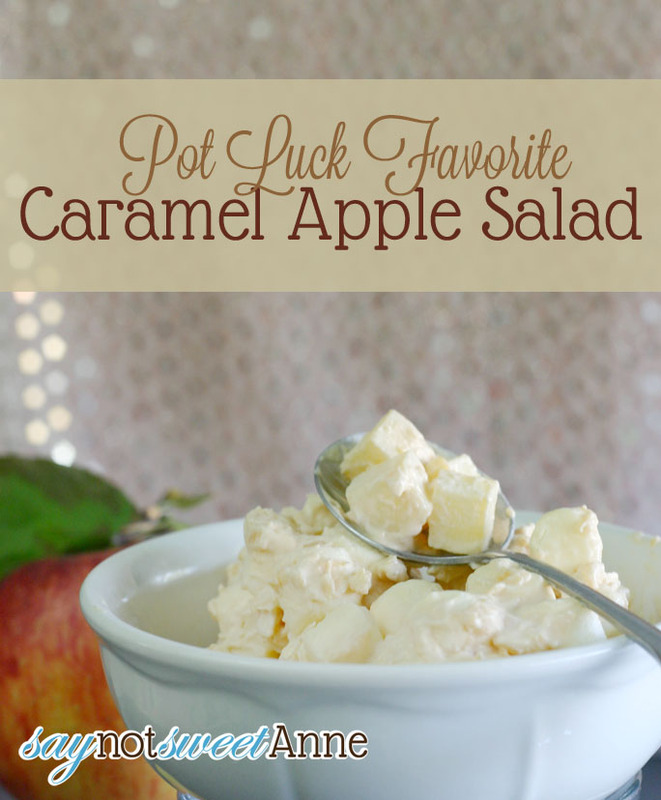 Including that “secret” caramel apple salad. In total covert spy style, I whipped out my cellphone and photographed the recipe, giddy to have this amazing dish for myself. I had big plans to wow my inlaws at every pot luck with my signature dish, denying all requests to share my secret. It wasn’t until the following fall that I decided to pull the recipe out of my stash and give it a shot. Unfortunately I had gotten a new cellphone and neglected to copy that photo! Crushed, I went to the internet hoping to find something resembling that “secret” recipe. You might have noticed the quotes around the word secret in this post. That’s because -as it turns out- this recipe is not anyone’s secret. After a quick internet search I found Its a quick and dirty compilation of pudding mixes, whipped cream and add ins. It bares resemblance to the popular Snickers Salad and it is ALL OVER the internet. But you know what? Its still amazing. I get compliments every time I bring it to a party and countless people ask for the recipe. What’s more, its easy and quick to pull together. So, while it might not be a secret, its still my potluck favorite. 4-6 apples, peeled and cored. 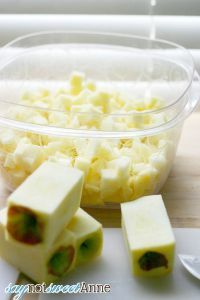 Dice your apples in to 1/2 inch squares. 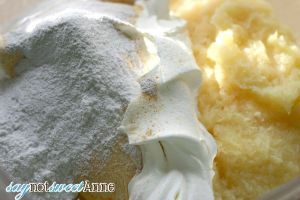 Combine Cool Whip, butterscotch pudding mix and pineapple in a large mixing bowl. Fold in apples, and marshmallows (and nuts, if using). Let chill at least 3 hours. If you make this and bring it anywhere, prepare for people to ask you for the recipe. I don’t hesitate to share it anymore, after all, its no secret! What a great salad, if all salads were like this I would eat salad for every meal!! LOVE me some apples!! Really fun idea for a dessert. I would think that maybe Mandarin oranges shredded up in the same way would work? Not only does it keep things moist, but it adds a fruitiness to combat the sweet caramel flavor. I’ve tried it without once (hubby doesn’t like pineapple) but it really needs it. I’ve thought about subbing in mandarin oranges for him, let me know how it works if you try it! i dont like nuts either…nor do i like pineapple. is there something else i can use? Has Anyone tried it without the pineapples yet? If you try it with the crushed mandarine oranges, please report back! Just wondering what size can of crushed pineapple to use? Just the “average” size 14.5 oz can! What kind of apples did you use? Red or green? I used red, but it might be good with green too! Do you drain the pineapple or use it with the juice? About how many servings does this salad make? I’m not sure it would be possible to drain the juice out of a can of crushed pineapple, as the fibers are so fine. Be sure to leave it in! The whole batch is about 2 quarts, so depending on your serving size it will feed a lot! Can this be made the night before or will the apples brown? Definitely Veda! The Pineapple seems to keep the apples from browning at all. They do get rather mushy on the 4th and 5th day though.